Express Pedicure – a cleansing, refreshing soak on our pedicure throne complete with nail care, light foot file, lotion application and polish. Spa Pedicure – a facial for the feet! Relax away the day in our massaging pedicure throne. Enjoy a foot massage, removal of non-living cuticle, nail shaping, a sugar scrub, foot filing, moisturizing masque and polish. Toenail Trim & File – ideal for our mature clients or expecting mothers who have a hard time reaching or seeing their feet. 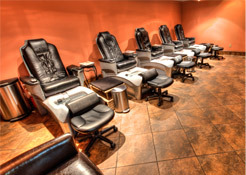 Spa Pedi Parties – great for bachelorette parties, retirement parties or birthday parties! We can accommodate five people at a time.